Trying to add a splash of variety to your toddler’s diet? Chicken is an excellent option. It is a rich source of iron, zinc and proteins, perfect to be introduced as a first food. Chicken is also very easily digested, making it preferable for babies as young as 6 months even. 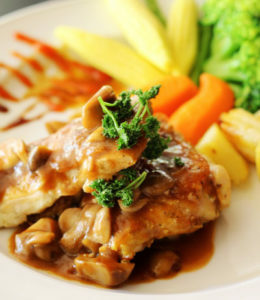 Superbabyonline presents to you this collection of chicken recipes especially for you! Many easily available chicken are mass produced on a large scale, artificially fattened with hormones and loaded with drugs. When we eat such poultry, the chemicals pass on to us, sometimes in amounts that may cause harm in the long run. Take care to source chickens from a small farm that you can directly visit, or choose organic chicken meat from a reliable house. Purees are versatile baby food. You can make as many varieties as you possibly can for your little one! To make a basic chicken puree, you need some chicken breasts or thighs so you won’t have any bones. Clean the chicken, place it in a saucepan/ cooker with some water and salt. Don’t overcook it; we are aiming for the tender and juicy stages. Around 20 minutes of covered cooking on medium-low flame should do the trick, or you could use 3 whistles in the cooker. The ‘done’ chicken should not be pink anywhere. After the chicken has slightly cooled, transfer it to a blender and puree well. This basic puree is very bland; you’ll get good results if you mix it with purees your baby is already familiar with. For the plain chicken puree, you can throw in some chopped coriander/paisley with a pinch of turmeric for a good taste. For some healthy fat, add unsalted butter or clarified butter (ghee) or a drizzle of olive oil. There is no right or wrong here, go by what your little one likes! 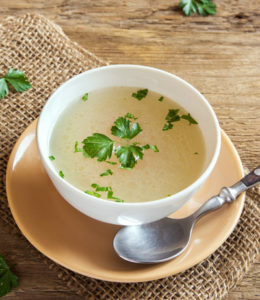 If your picky eater loves drinking stuff vs eating them, you could try soups. For a simple soup, boil the bones with a pinch of salt, coriander and some chopped garlic. For advanced versions, you can add chopped onions, peppercorns, carrots, peas, potatoes or cabbage. You can also add some lemon juice, mint leaves and bay leaves in the end for added flavour. Filter the soup, in the end, to remove all bones, as they could be a choking hazard. Simmered chicken is another basic recipe, good for starters. Grab a pan; throw in some diced chicken breast with a peeled and chopped apple. Pour some water and simmer for around 20 minutes. Keep an eye on the water level when cooking. You can mix, mash or puree this for your baby. You can also add other veggies like sweet potatoes and can use broth instead of water if your baby likes. This can be a standalone meal, or it also combines with rice well. Peaches, mangoes, apricots, apples, and papayas blend in well with chicken. Add chopped chicken and chopped fruits to a medium pan. Cover and cook for 20 minutes. You can puree the fruity goodness for babies or serve the mushy cubes directly for texture loving toddlers. Light porridges made with rice, ragi, barley or sago can be deliciously nourishing for babies. To make porridges, cook rice, ragi, sago or barley separately and the chicken tenders separately. Transfer both to the blender with a pinch of salt and make a puree. You can also skip making the puree and serve with ghee for older babies. Lentils and chicken combo is a winner of tastes and nutrition. It can be a little heavy for 6 month old, so first try either lentils or chicken for a few days and then progress to feeding both. Wash and soak the moong dal in a bowl. In the meanwhile, begin cooking the chicken in a pan with oil, onion, garlic, tomato, turmeric, salt, curry leaves and some water. When the chicken is cooked, typically in 25 minutes, add the dal to it and cook for 20 more minutes. Garnish with coriander leaves. You can make the dal chicken as thick as you like. It makes a delicious meal on its own and can also be served with rice, idly, dosa or roti for older babies. Spinach and greens are a big no-no among little ones. But feed them with chicken, and they’ll be bowled over! 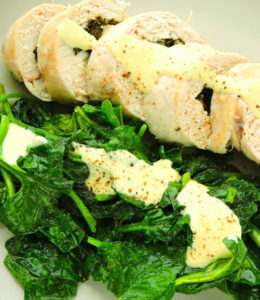 To make a pot spinach chicken, take a heavy pan, and grease it with butter. Add chopped garlic to the hot pan and sauté for a minute. Toss in the chicken next and swish for 5 minutes. Sprinkle some salt and add chopped spinach to the pan. Cook for 15 to 20 minutes until the spinach is soft and serve. You can mash this for your baby or serve with fried onion rings for older kids. If ovens are an indispensable companion of your regular cooking, here’s an awesome recipe for you from Buonapappa! Preheat your oven to 180°C or 400°F. Brush the chicken and chopped carrots with olive oil in a baking pan. You can add a pinch of salt if your baby is older for flavour. Let the carrot chicken bake for 20 to 25 minutes. In the meanwhile, bring water to boil on the stovetop. You can also use salt-less vegetable broth or chicken broth for added delicious and nutritious goodness. Add the rice and saffron, stir well, cover and let it cook in simmer for 20 minutes. After 20 minutes of cooking, the rice and chicken will both be ready. 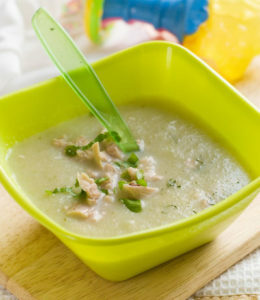 For toddlers, add the grated cheese on top of creamy rice and serve with chicken bits. For babies, puree the rice, carrots and chicken with a little water for a delicious meal. You can also freeze this in batches for later use. Kids love bite-sized meals that are crunchy – here’s a wonderful recipe for popcorn chicken from yummytummyaarthi for you! Mix the Curd/buttermilk, the chicken and a pinch of salt in a bowl. Cover it and set aside. Add the flour and all the other spices to another bowl with a pinch of salt. When the chicken has marinated for one hour, toss it in the flour mix. Deep fry in oil and serve hot. 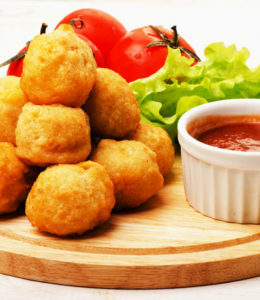 Fried Chicken Poppers are made by mixing chicken mince with lots of veggies, coated with corn flakes and deep fried. These are yum, crispy on the outside and soft on the inside, the perfect place to hide veggies! *Evil Laugh* you can also serve this to your guests as an appetiser. Take 200 gm of minced chicken and spread it on a cotton cloth to remove all moisture. Take a bowl and add all the above ingredients, except the last three – oil, dissolved cornflour and breadcrumbs into it. Soya sauce already has some salt in it, keep note of that when adding salt. Mix them well evenly. Your mix is ready now. Roll the patty into small balls and arrange them on a plate. Add toothpicks, and they should look like lollipops now. If your balls are bigger than 7 cm in diameter, make them flat to avoid uncooked insides and add a stronger stick to them. Place the lollipops in the freezer for an hour. If you don’t freeze it, the patty might come loose and fall off when you handle them during dip and fry. Once they freeze, dip the balls in the dissolved cornflour and then roll them on bread crumbs/ crushed corn flakes. Freeze again for an hour. Deep fry the poppers on a medium-low flame for 10 minutes till the crumbs turn golden brown. Serve immediately with ketchup/ hot sauce.